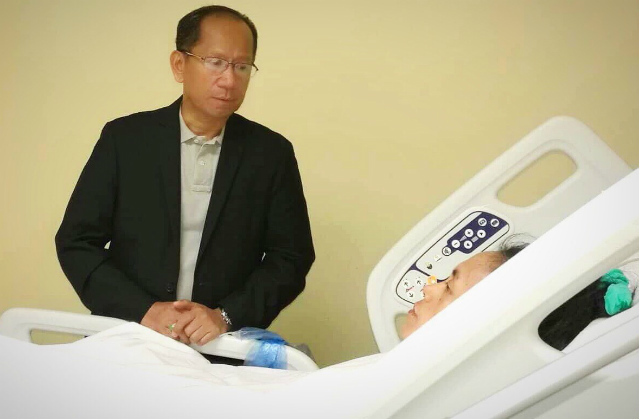 Consul General Edgar Badajos visits Agnes Mancilla in hospital. Officials in Saudi Arabia have filed a torture case against a woman who allegedly forced her Filipina maid to drink household bleach. “We would like to thank authorities in Saudi Arabia for filing the necessary charges against the employer who abused our kababayan [compatriot],” Foreign Affairs Secretary Alan Peter Cayetano said today (Thursday, September 20). Mr Cayetano issued the statement after the Philippine Consulate General in Jeddah reported that authorities in Jizan Province have completed their investigation of the case of Agnes Mancilla, aged 35, from Infanta, Quezon. “We are counting on our Saudi friends in ensuring that our kababayan would be able to obtain justice for the unthinkable deed committed against her,” he added. The Consulate General said Mancilla was rushed to the King Fahad Central Hospital on April 2 and placed in intensive care for internal injuries sustained after she was allegedly forced to ingest the chemical agent. Consul General Edgar Badajos said Mancilla’s employer made her drink the bleach after she reportedly made a mistake in preparing tea. Badajos said they later learned from Mancilla that her employer had been forcing her to work for about 20 hours a day and was only providing her with coffee for her meals. Lawyers retained by the Consulate General said Mancilla’s case will now proceed to full trial. The lawyers said if the employer is found guilty, she will be sentenced to a prison term as well as possible lashing. She will also be made to pay the Mancilla financial compensation. More than 10 million Filipinos work overseas to seek better opportunities and send back money to their families. Of this number, around 2.3 million work in the Middle East and Africa. Make that Slave driver drink the same bleach. I think that’s the only acceptable punishment. Agreed. Any eye for an eye and a tooth for a tooth. Absolutely barbaric.